Seems to be the cheapest its ever been. 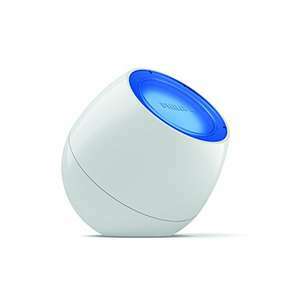 Can it be used as a mood light by choosing a colour or does constantly change colour? Anyone know if the battery compartment is held on with a screw? Not mains powered and functions on 3 AA batteries. Despite the good price, it’s not for me. Heat added though. I bought one when higher in price. I really wouldn't bother. They are not good and emit hardly any light at all. They are not the same thing as the "mood lamp" in terms of specs. Not mains powered and functions on 3 AA batteries. Despite the good price, …Not mains powered and functions on 3 AA batteries. Despite the good price, it’s not for me. Heat added though. Think we are confusing the 2 different light options here - sound light is battery operated, mood light mains powered. It clearly says works with 3AAA batteries so not for me as well. "It's not mains powered as suggested - I received it today and it takes 3 AA batteries, no plug supplied (and no port for power anyway!). It's going right back, it's pointless as a living room light for me as 3 AA batteries wont last long and can't be controlled by the sockets that feed other devices in the living room. " Bought 2 for stocking fillers! Great find OP! TAKE SOME HEAT!!! These are great lights but, unlike some others in the LivingColours range, they don't work with Hue. Hmm this must have a dsp chip in it and a mic to listen for sound. I am tempted to get one to see what’s inside- link to a Raspberry PI project? Don't buy this it's the turkey of the range. The mood lamp is great, adapter powered, but not Hue, be warned! Our friends have these and my wife loves them so another xmas surprise sorted! I’m going to buy it! Do I need it though? No. Yes, it's held on by a small Philips screw. Literally just jumped back up in price as I was looking at it, now saying £21.49. Maybe this was a pricing error? Must have gone back up. Now 21.49 for me with prime. I was going to buy now as it looks good. But I am not going to click the link as I have just read lots of comments on here saying these are no good, not mains powered, flickers etc. Not coming up at this price for me - shows at £23.99 - is there some sort of code? Despatched. Seems to coming from Germany?? !